The original Gabriel Knight: Sins of the Fathers is universally recognized as one of the great classics of point and click adventure genre. It’s a testament to its status that I’ve had on my “to do” list for about 20 years now, but I never got around to playing it until the 20th anniverary edition came around. This wasn’t my first encounter with Gabriel Knight though – I had previously played the sequel, The Beast Within. That game is quite different from Sins of the Fathers because it features a lot of video recordings and digitized video characters, whereas the original was much more of a traditional adventure game. What made these games different from their contemporaries was its tone – more serious than most video games, with hints of mystery and intrigue throughout. It’s the stuff that drew me to Dan Brown’s novels, and it’s what always kept me interested in Gabriel Knight as well. 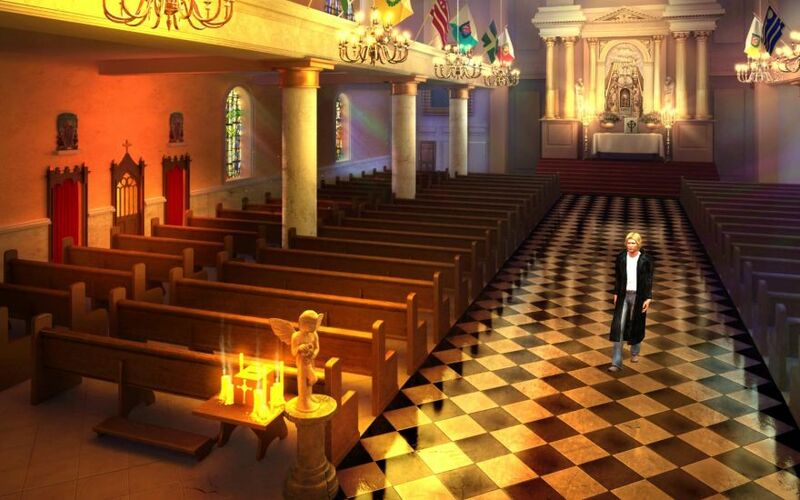 Sins of the Fathers chronicles the experiences of Gabriel Knight, a writer and bookstore owner in New Orleans. Before long, Gabriel finds himself in the middle of a voodoo murder mystery – and the plot developments hold a special place for him amidst all of this as well. The story itself is divided up into days, which essentially serve as chapters that you complete by visiting key locations and completing the necessary interaction and conversations. You’ll notice that storytelling is much more integral to the experience here than in, for instance, the Telltale games. Especially during the first two hours of play, you’ll engage in a lot of conversations that set up your relationships and your understanding of the environment and the factors that shape your personality. This doesn’t just help in setting up the intricate storyline that unfolds later on, but it also helps you in getting used to Gabriel Knight himself, who is a bit of an acquired taste. Sometimes cynical, sometimes even a little rude, this isn’t your typical hero character. In fact, a lot about Gabriel Knight is actually far from conventional. This made the game groundbreaking back in the early 90s and it retains a lot of that charm to this day. Excellent storytelling comes first and foremost, and everything else you only really notice when you’d rather not. What I mean by that is that you get engrossed in the story to such a degree that everything that takes even a little bit away from that experience becomes a negative. Luckily, the list of instances like that isn’t too long. Every now and then, certain lines can be delivered sounding a little awkward. And every now then, there seem to be some technical issues with the collision detection. The team at Phoenix Studios has expressed their desire to fix these little bugs, and we’ve already seen a few updates since the game was released earlier this week. So how happy was I with Gabriel Knight after 20 years of waiting, and how does it play for someone who’s a newcomer the Sins of the Fathers? My conclusion is that as a videogame, Gabriel Knight may not be the most exciting thing to play out there. Its strength isn’t in its gameplay dynamics or puzzles (which in some cases can border on ‘random’), which sometimes even take away from being immersed i the story. However, as a piece of interactive fiction, it triumphs – the level of writing here is top notch and rivals that of many popular thriller novels. But instead of a 90 minute movie adaptation, you get a chance to assume the lead role in an adventure that will last you about about 10 hours to complete. That has to be a good deal.